Tall and handsome Bill has managed to keep his personal life so secret that nothing relating his affair and relationship status is published. It seems like he wants to keep such a matter private and live like a common person. According to our record, Bill is currently single. 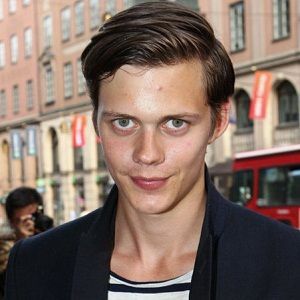 1 Who is Bill Skarsgård? Bill Skarsgård is a popular Swedish actor. He is extremely prominent for “Simple Simon” (2010), ‘Hemlock Grove” (2013) and “Allegiant” (2016). He is also known as a son of popular Swedish actor, Stellan Skarsgård. Talking about his early life he was born to Stellan Skarsgård and My Skarsgård on August 9, 1990, in Vällingby, Sweden. His father is an actor known for film “Pirates of the Caribbean: Dead Man’s Chest” (2006) and“Mamma Mia!” (2008) and his mother is a physician. He spent his childhood with parents in a friendly and entertaining environment along with his five siblings: Alexander, Sam, Gustaf, Eija and Valter and two half brothers Ossian and Kolbjörn. His nationality is Swedish and belongs to European ethnicity. Being a son of actor, he was highly passionate towards acting from the very early age. There is no information published relating Bill’s educational background. It wasn’t so difficult for Bill to start a career in the acting field. His father and elder brothers have made a strong base for which Bill easily started his career. He made his debut in the film in the year 2000 and appeared in a film, “White Water Fury” as ‘Klasse’. He got positive responses and reviews from fans and viewers which really encouraged him to act in other films. After two years in 2002, he appeared in one of the episodes of T.V miniseries “Laura Trenter” as ‘Klasse’. One of the successful T.V series in his career until now is “Hemlock Grove” (2013-2015). In 2010, he appeared in “I rymden finns inga känslor” as ‘Simon’ for which he was nominated for a Guldbagge Award. In 2012, at the age of 21, Bill won the European Film Academy’s Shooting Stars Award which is one of the great achievements in his lifetime career. He gets paid a handsome amount of money from different films and T.V shows and series. His net worth is $5 Million and his salary is unrevealed. There are no drastic rumors regarding Bill’s personal and professional life. It seems like he is doing best job without harming others for which he hasn’t been a part of radical controversy yet. Moving towards his body measurements, he is 6 Feet and 4 Inches(1.95m) tall and his body weight is 85. He has fair hair and his eyes are green.